Proper collection of the hair sample is extremely important and cannot be over-emphasized. Collection should be done under professional supervision, or by someone trained in proper collection procedures within a clean environment. The following guidelines should be maintained to insure the collection of a metabolically representative sample and to avoid the introduction of external contaminants prior to, during and following the collection process. Scalp hair is the only source recommended for analysis. Pubic and other body hair should only be used as a last resort if scalp hair is not available. Note: Pubic and other body hair is only recommended for confirmation of elevated toxic metals found in the scalp hair and/or to rule out external contamination of the scalp hair. The portion of hair to be collected should be untreated, i.e. not permed, dyed or bleached. If all of the hair has been chemically treated, wait until sufficient new virgin growth has emerged to allow collection. The hair should also be free of all gels, oils and hair creams prior to sample collection. For those individuals environmentally and/or occupationally exposed to external contaminants, (welding, mining, etc...) special care should be taken to limit exposure between washing of the hair and the collection of the sampled hair. Note: All reference range correlations, dietary recommendations and interpretive report content assumes that the complete hair specimen originated solely from the above defined regions of the scalp. High grade stainless steel scissors or thinning shears should be used to cut the hair as close to the scalp as possible. The length of the collected hair should not exceed one and one-half inches. The proximal portion (one and one-half inches closest to the root) should be retained and the excess discarded. The weight requested for a hair specimen is 125 milligrams (0.125 Gram). Use of the TEI Hair Weight Scale Cards will insure the collection of sufficient sample weight. However, if a Hair Weight Scale is not available, one full teaspoon should approximate the weight requirement. 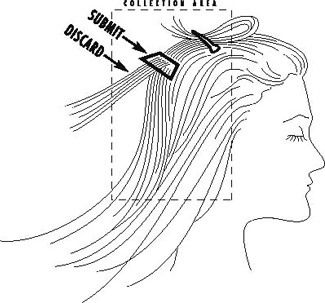 Upon cutting the sample, the hair should be placed directly into a clean hair specimen envelope normally provided by the laboratory and then sealed with the glue flap only. Do not use plastic bags in place of the standard paper envelopes to hold the hair specimen. In addition, do not use staples, paper clips, adhesive tape, aluminum foil or other metal and paper material of any kind to seal, secure or wrap the hair envelope and/or the hair specimen contained within. Each sample specimen must be accompanied by a standard HTMA Laboratory Submittal Form, completed in its entirety and signed by the health professional. Copyright 2004 - 2011 | Trace Elements, Inc. | All rights reserved.